Kaibab Animal Hospital is a full service companion animal hospital. We offer a full veterinary laboratory, spay & neuter, pet surgery, an on-site pharmacy, injectable heartworm prevention, and tick and flea control products. Our experienced team of veterinarians welcomes you to our veterinary practice serving Scottsdale, AZ. We are located on the west side of 68th street just north of Thomas Road and are open 7 days a week, including evenings and weekends. Kaibab Animal Hospital has been practicing comprehensive veterinary medicine in Scottsdale, AZ since 1971. It is our daily privilege to provide compassionate and industry-leading veterinary care to your dog or cat. We offer surgical, medical, and dental care for your feline and canine companions. We also maintain a full-scale health program for your pet that includes annual physical exams, vaccinations, and parasite control. Our facility is fully staffed and equipped, offering digital x-rays, digital dental x-ray, EKG, in-house blood chemistry analysis, and laser therapy for pain management. At Kaibab Animal Hospital, we combine progressive veterinary technology, compassionate care and preventive veterinary medicine to ensure your pets lead healthy and full lives. Our hospital is proud to offer annual health plans to provide consistent, pro-active health care throughout each of your dog or cat’s life stage. These comprehensive health plans were designed to help our clients proactively manage their pet’s health and receive great discounts on preventive services, as well as additional discounts on all other professional services and medications, while spreading the cost of care over 12 months. These health plans come in a variety of different levels to fit your pets’ medical and wellness needs. We truly value our clients and want to make leading veterinary care for your pet easily accessible and affordable. We look forward to being your partner in your pet’s health and well-being and are always available to answer any questions you may have regarding the health and wellness of your pets. We pride ourselves on our close client and community relationships. Come in and join the Kaibab Animal Hospital family today! Schedule an appointment by phone at (480) 947-8113 or via email at [email protected] Our client service specialists are standing by to assist you. Our mission at Kaibab Animal Hospital is to produce the highest degree of quality medicine in a compassionate and caring environment. Our goal is to lengthen and enrich the relationship between you and your pets. We firmly believe that your pets’ health is best maintained through preventative care and education. We are truly committed, as a team, to the pursuit of excellence in veterinary medicine. Our mission at Kaibab Animal Hospital is to produce the highest degree of quality medicine in a compassionate and caring environment. Our Strengths: Walk ins available even on Saturdays and Sundays, cold laser therapy, long standing reputation in the community, personal relationships with clients and their pet. Minimal waiting times: At Kaibab Animal Hospital we realize how important you time is. That is why we strive to keep wait times to a minimum. In order to minimize your wait time and to maintain a calm and quiet environment in the hospital, we pre-schedule appointments. To schedule an appointment call our office during regular office hours or click on our Schedule appointment tab today. Emergency Services: At Kaibab Animal Hospital our highly trained veterinarians, technicians and support staff are there for you 7 days a week. We understand how important pets are to you and your family. We know that emergency situations can be stressful for everyone. That is why during an emergency situation we do everything possible to make you and you pet as comfortable as possible. We will do our best to work with you to find a treatment option that is best for your family and for your pet. 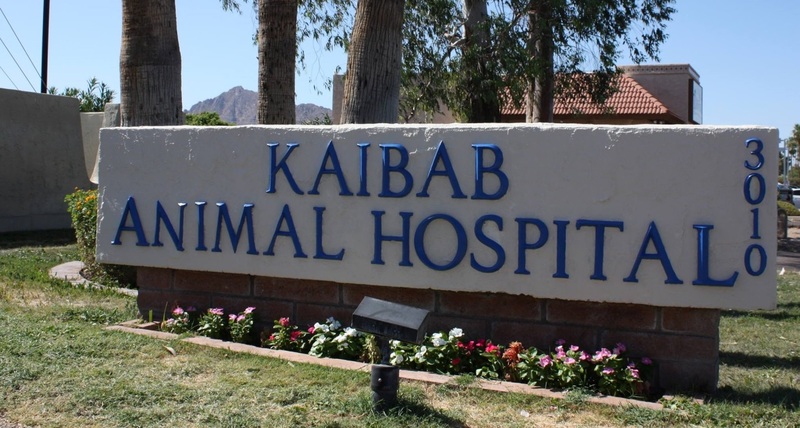 Compassionate Care: Our mission at Kaibab Animal Hospital is to produce the highest degree of quality medicine in a compassionate and caring environment. Our goal is to lengthen and enrich the relationship between you and your pets. We firmly believe that your pets’ health is best maintained through preventative care and education. We are truly committed, as a team, to the pursuit of excellence in veterinary medicine. At Kaibab Animal Hospital we strive to offer not only sound advice, but also optimal veterinary care, thus allowing you the enjoyment of your companion for a maximum number of years. Our job is not only to treat your pet when he or she isn't feeling well, but also to help you learn how to keep your best friend happy and healthy. Family Atmosphere: Kaibab Animal Hospital has been practicing comprehensive veterinary medicine in Scottsdale, AZ since 1971. We pride ourselves on our close client and community relationships. It is our daily privilege to provide compassionate and industry-leading veterinary care to your dog or cat. We offer surgical, medical, and dental care for your feline and canine companions. We also maintain a full-scale health program for your pet that includes annual physical exams, vaccinations, and parasite control. Come in and join the Kaibab Animal Hospital family today!